I am long the British Pound. In this example of currency trading, I have identified what I believe to be bottoming action and I have taken a long position using daily charts in the Pound. I have been keeping my eye on this currency for a few days, as I suspected some type of bottoming action to occur. I decided to enter my position this afternoon. I bought the pound at 1.5655 at 16:25 my time. As always, I am using a stop loss order to limit my risk exposure. I am looking for a multi-week move from this trade. Although, I will exit earlier if I must. As we all know, most of these more heavily traded currencies seem to trade in a longer time-frame trading range. I am feeling the pound is in its lower ranges right now. 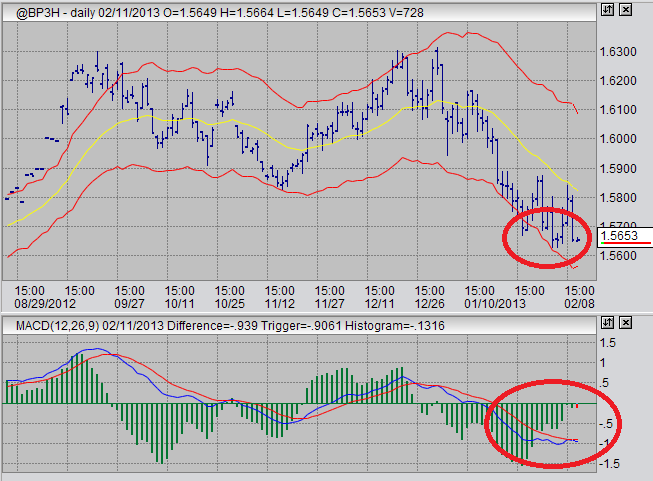 Also, I have noticed the pound is particularly sensitive to MACD divergences on the daily time frame. Other currencies, in which I have found this to be true, are the Australian dollar and the USDX. One currency that seems to fail to respect trading ranges is the Japanese Yen. Or maybe it just has a really wide and loose range, who knows. I've only ever traded the yen once, and it was a fairly profitable trade. I'm not really looking to get into that market, at all. Currency trading can be tricky, you know. Let us observe a daily chart for the March contract of the British pound. Here, I have circled the areas that I believe are displaying bottoming action. You could argue yes and no as to whether or not this is an "MACD divergence", but I am following my gut and experience and I have entered my position. Ideally, I would have liked to enter below 1.5627, and prices may yet reach that low today (tomorrow). As I said, I followed my gut and made my move. My positioning is based not only on this price action, but also on some COT data that I have been following. Combined, I felt compelled to take my place. Again, I have a stop loss order in place, in case my trade turns out to be a disaster. That way, even though the trade was a disaster, it will not be a disaster relative to my account balance. Always trade with stops. Learn to use stops effectively. I will, at some point, be writing about this topic. I am still long gold. We have seen a lot of volatility within a trading range in this market over the past two months. I am still of bullish sentiment here, although my faith seems to be getting tested a lot. For now, I am still long and of bullish sentiment in the gold market. I am very seriously considering taking on a long sugar position with the slightest pullback, even of just 0.20 pts. This is a market I am watching VERY closely. I am looking for a long position into cocoa. If we see a new low in this market, I'm gonna be on that like a dog in heat. Well, maybe not, we'll see. I am looking to short crude oil. This is probably my most foreseeable preferred trade of the time being. However, its not quite time yet. Follow this futures blog to keep up to date with my latest trades.